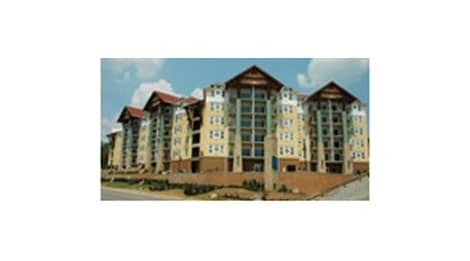 Cherokee Lodge is the newest condominiums to Pigeon Forge. The large open floorplans are great for families on vacation! Units include granite countertops,wood floors,whirlpool baths, gas fireplaces and private balconies. There’s an outdoor pool area with a slide to keep the kids amused for hours! Not only is Dollywood is only 1.5 miles away but the condos are right across the street from Patriot Park and Old Mill Village. Cherokee Lodge is Pigeon Forge’s newest condo development, we are designed for the traveler that needs 2 or 3 private bedrooms without the cost of several hotel rooms. Our spacious 2 and 3 bedroom luxury units offer, granite countertops, fully equipped galley kitchens, wood floors, whirlpool baths, gas fireplaces, and private balconies. We are located 1.5 miles from Dollywood and across the street from Patriot Park. Cherokee Lodge is within walking distance of the Old Mill Village, and in the center of it all! Click below to book your next Pigeon Forge package! Not only will you receive your room confirmation, your attraction and show tickets will immediately be available for you to print!